Everybody likes Out Run. The Ferrari, the music, the multiple paths; it’s all good. As one of the seminal racing games ever made, it has achieved almost legendary status. Originally released on the Sega Master System, it was brought to the Genesis in 1990 and was considered the best version until Sega brought it back for the Sega Ages Series. Anyone with a Saturn and half a brain has the Working Designs domestic compilation in their collections, as it also includes After Burner II and Space Harrier (both incredible with the Mission Stick) but a Sega system without some version of Out Run just isn’t complete. There’s nothing complicated about the game really. You take control of a Ferrari Testarossa (babe riding shotgun and all) and race from stage to stage before the timer runs out, with each race lasting up to five stages. When to shift gears and brake are your only worries here, as to be expected in a driving game. What makes the title unique though, is the fact that you can choose your path at the end of each stage. Whether you go left or right, you have plenty of options to make each race unique and worth playing. With a total of five possible goals, there are also multiple endings, which add even more to its replay value. The thing that really makes Out Run so refreshing and exciting is the myriad of environments one encounters while racing. From cloudy skies to sandstorms and beach side highways, you’ll be hitting start again after every race just to see all the stages. It takes a while for one to race all the possible route combinations and even after doing so the game never gets old. Traffic adds to the challenge, with big rigs, sedans, and Beetles littering the highway (they always seem to be in the inside lane when a turn comes up!). You can choose between six (!) difficulty levels, which essentially alters the amount of traffic and starting time you have, so there’s something for everyone. As a whole, Out Run on Genesis has aged decently enough. Some might find the scaling a bit choppier than they remember however (not as bad as Turbo Out Run but that’s a tale of woe for another day), and the game does seem to be a bit slower than the arcade for it. The graphics themselves are extremely close to the System-16 original and only perfectionists will really see the differences. I loved the color scheme of the coin-op and was very happy to see that the Genny was able to pull it off in striking fashion, though they’re not as bright. Backgrounds are nicely detailed and little things, like your driver and lady friend’s hair flowing in the wind, are great little touches that maintain the feel you got when you played it in the arcade (the deluxe cab was incredible). This is Out Run, folks, and only the Sega Ages version or the arcade ROM are better. Is there anything else that can be said about the music which hasn’t been repeated ad nauseum? Who doesn’t know Passing Breeze or Magical Sound Shower? There are four tracks to choose from when you race and all are complete (even MSS‘s keyboard solo is there!) This is truly one of the gaming’s great soundtracks and will definitely keep you humming while playing. I know people who have these tunes on their cell phones for crying out loud. They’re that good. The voice sounds crisp and clear and all the sounds from the coin-op are here, even the annoying sputtering sound from when you go off the road. I’m glad that the effects don’t bore directly into your brain, as is the case in many other racers (glares at Super Monaco GP). 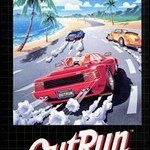 Chances are that if you own a Genesis, Out Run is in your collection. If not, then shame on you! Quality racers on the system are hard to find and one as great as this are rare indeed. I still play mine regularly, even though I have the Saturn compilation, as I have no patience for the save data bug which plagues that version (basically, if you start a game with a saved Out Run game in your Saturn RAM, the game reboots automatically to the system’s utility screen). Aside from some minor scaling issues and the dimmed colors, Out Run for the Genesis is a great game to play and own. I love the feel it has and those endings still crack me up. If you like racers with a twist, check this version out. You won’t regret it. For the time, Outrun plays alright, and the graphics and sound are almost there, but the scaling is so unbelievably choppy that in this day and age that there’s no reason to play it today when there are plenty of arcade perfect-ports available, like on the Saturn, Dreamcast, and Xbox.